You want your home to look its best every day of the year, but inside and outside elements are not kind to your home, especially the windows. These residential window cleaning facts and tips will help you maintain your home’s perfect interior and the exterior appearance by properly maintaining the window panes and window frames. It’s a great idea to have your windows cleaned by a professional at least once every two to three months. Why? You want your family and home to remain as healthy as possible. Debris collects on the inside and outside of your windows, not only making them difficult to clean, but possibly scratching and damaging them, which could result in expensive repairs. The window sill can be the most difficult part of the window to clean. The brush attachment on a vacuum is a great tool to use to remove dirt, bugs, and other debris from the window sill. 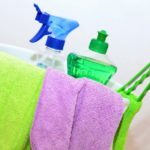 As far as the window pane (the actual glass in a window), dish detergent and water combined is an awesome cleaning solution, as well as, vinegar and water. Squeegees and sponges are your window’s best friend. With these tools, you don’t have to worry about damaging the glass. When you begin, start in an upper corner of the window, and take your time working your way down the glass. Using a clean cloth, gently dab the window pane, ensuring there is no water left behind. One of the good things about using vinegar or dish liquid is there are no streaks or spots left behind. Don’t forget about your window frames, especially if they are made from wood. Leaving cleaning solution on these frames causes wood to rot and a variety of other issues. Why Do Windows Need to be Maintained? Aside from health reasons, windows need to be maintained for longevity, as well as, appearance. When you take care of windows, they last longer. Glass is prone to a short lifespan because it is porous. Without proper care, pollutants and contaminants greatly decrease the lifespan of a window pane and window frame. Replacing window panes and frames are a costly repair and can be avoided with a regular cleaning, including dusting, routine. Rotting and sagging window frames can be prevented by properly maintaining all aspects of the window. Weather is another reason you should regularly maintain your windows. Unfavorable weather, including hard rain, hail, and pollen can make your windows appear dusty, foggy, and leave a film of dirt. Severe thunderstorms can throw leaves, dirt, mud, and other debris directly into and on your window. Leaving these items on your windows makes them weak, and they will not be able to serve their purpose. Why Choose Window Cleaning Miami? Would you like to know more about window panes, window frames, and the benefits windows give your home? Window Cleaning Miami is ready to help. There are a lot of window cleaning options in Miami, but Window Cleaning Miami brings expertise, unmatched skills, and talent to the area. Window Cleaning Miami specializes in residential, commercial, and high rise window cleaning. Contact Window Cleaning Miami today for an immediate, no-obligation quote.